With precious understanding of the relevant industry, we are counted as the top most manufacturer, trader, exporter and supplier of Electric Baby Chain Hoist. Offered chain hoist is designed to move loads either vertically or horizontally. 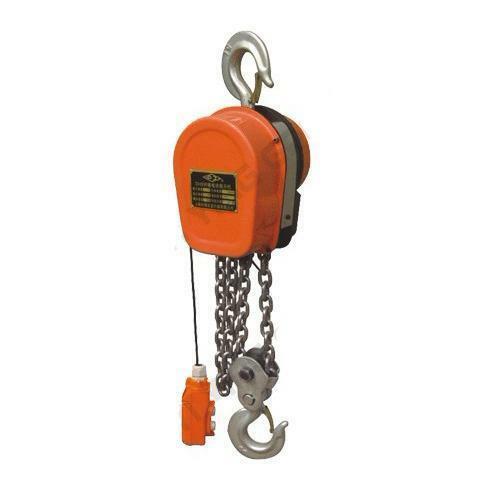 The offered chain hoist is designed using high grade material and modern techniques in compliance with international quality standards. Moreover, this chain hoist is availed in the market at reasonable prices. Since 1991, we Kumar Machine Tools have been engaged in manufacturer, trader, exporter Machine Tools like Chain Blocks, Electric Hoist, Chain Slings, Industrial Hooks, Industrial Winch, Industrial Trolley, Material Handling Accessories, Turn Buckle and more. These are designed and manufactured sing optimum quality raw material and latest technology at our end. The products that we offer are known for their durability, easy operation, and low maintenance. Owing to their superior features, these products have enabled us to muster a huge client base across the nation. All our products are widely used in construction, marine and automobile industries. We have established a state-of-the-art infrastructure at our unit in order to manufacture the bulk and urgent consignments of our clients within the promised time frame. Moreover, we have erected this unit with the latest material handling tools and advanced technology in order to provide superior quality products to our clients. For the smooth and streamlined process execution, we have recruited a diligent team of professionals, which manages and controls all the manufacturing related processes in an efficient manner. These professionals possess vast experience and knowledge in their respective domain.